I’ve been reading and thinking about non fiction picture books a lot lately. One reason is that there seems to be quite an abundance of them. Which, I think is a good thing. But, getting a non-fiction story to work has added hurdles. Its subject matter is usually known to the reader. The author doesn’t have the luxury of creating a surprise ending, or an unexpected plot twist. The illustrator is challenged to draw their own interpretation of a ‘real’ person, thing, or event. And there will be experts on any nf subject that you write or illustrate that will be watching you, watching you. I’ve been so excited to see the way pb teams are injecting creativity and interest to solve these challenges. 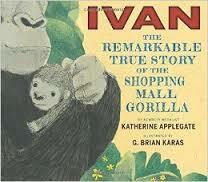 One book that really wowed me is IVAN, THE REMARKABLE TRUE STORY OF THE SHOPPING MALL GORILLA. Written by Katherine Applegate, beautifully illustrated by G. Brian Karas and published by Clarion. We immediately have the sense that these descriptive words are foreboding. A few pages later ‘calm’ is replaced by ‘loud’, ‘gentle arms’ to ‘cruel hands’ and we are given the verb, ‘stole’. Things will never be the same. And so Ivan’s journey begins. He is taken to live among people and is treated like a human baby. 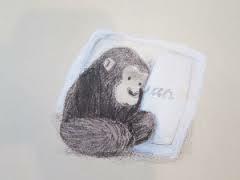 Truly, the illustration that accompanies Ivan’s companion baby gorilla, Burma, passing away, drew a tear. What I thought Katherine Applegate accomplished so successfully in this book was finding the voice to tell a captivating story without preaching pity. Instead, I felt I came to a real feeling of empathy and compassion just by her telling me the facts of Ivan’s life. The back matter fills in all the holes with pictures and many more details of Ivan’s life. There is even a very touching note from Ivan’s main keeper at the end. I found this book so successful because it is first and foremost, a beautifully told story about a gorilla who lived a very unusual life and is accompanied by expressive, but simple illustrations that show me how Ivan is feeling. Secondly, it happens to be a true story which makes it even more intriguing. And third, I am treated to answers to any questions that I might have had by reading the afterword of the book. Clarion, G. Brian Karas, Ivan, Jennifer Black Reinhardt, Katherine Applegate, Non fiction picture book, The Remarkable True Story of the Shopping Mall Gorilla. Bookmark. Nice post, Jennifer. This is a wonderful picture book that will serve as an intro to the middle grade version. Both bring about emotion and empathy for Ivan – and all captive gorillas. Thank you, Wendy! You are quite accomplished at this genre yourself! Your beautiful nf book, WHEN ANJU LOVED BEING AN ELEPHANT, also evokes the same empathy from the reader. Blog visitors should check out your wonderful book, as well! Thank you for visiting and commenting! Jennifer, thanks for this post on non-fiction pbs. I’ve been reading many of them lately too, with Ivan on my to-read list. It is definitely a genre I hope to get more involved in as a writer. Best wishes, Jennifer! I think it’s exciting that non fiction is being taken in so many creative directions. Thanks for stopping by! It must have been challenging to turn such a successful middle grade book into a picture book. What to leave in? What to take out? It looks like they did a beautiful job. I laughed at the experts “watching you, watching you,” btw. Yes, scary! Very good point, Linda about how hard it would be to turn a mg into a pb. The author would have the luxury of illustrations that they didn’t have in the mg and be able to rely on them to fill in and tell some of the story. But so challenging to decide what to edit and what angle to take. I guess Katherine Applegate had that extra hurdle as well! Thanks! Jennifer–Thanks for this! Yes , it is quite the art to master. I’ve written a few but have not yet found a publisher. But there is soooo much to learn by examining the successes. Hi Evie, thanks for your visit and your comment. I am noticing such a wide variety of styles re: non fiction and that authors and illustrators (and editors and art directors) really seem to be pushing the envelope and trying new styles. My fingers are crossed that this helps open doors for your books soon! Best wishes! Yes, Jennifer! 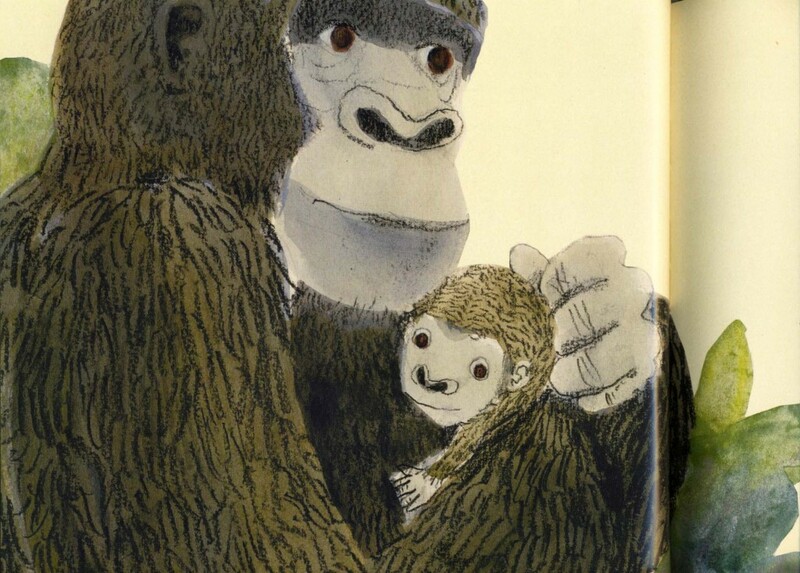 IVAN, The Remarkable True Story of the Shopping Mall Gorilla, is a memorable picture book. I, too, was *wowed* by the true story that is beautifuly told by Katherine Applegate. The illustrations by G. Brian Karas are delightful. Even my husband and 22 year old son enjoyed reading all about Ivan. Thank you, Suzy! I’m so glad that you love the book, too. Thanks for visiting! Thank you for this post. I can’t wait to tearfully read Ivan’s story. Enjoy, Sandi! Thank you for visiting our blog! Like many of my favorite books, reading IVAN put a lump in my throat. It’s one of the treasures of my bookshelf. This book was so touching, with the perfect voice, and lovely, heartfelt illustrations. The One & Only Ivan is one of my very favorite books too–such a gem, and so moving. I laughed and cried so much when I read it, and it works so well as a read aloud too. Hi Maria! Thanks for visiting and commenting. I agree, the illustrations are so subtle, yet so moving. Take care! Thanks for posting this, Jen. I loved the story as a middle-grade and can’t wait to read it as a picture book. Ivan’s story made a huge impression on me for so many reasons. Very poignant but hopeful too. The opening lines you reference here are gorgeous, as are the illustrations. Looking forward to reading it! Thank you, Tess! I think you will really appreciate the author’s attention to word choice. I hope you enjoy it as much as the mg version. I did… Thanks for commenting! What a tender post! It is an exceptional picture book. I do love the simplicity in how Ivan’s tale is told, in both illustration and text. I know the background story all too well, as the infamous shopping mall where Ivan was kept was located in my homestate of Washington. Thanks, you! Hi Claudia, thanks for your comment. I’m glad you enjoyed this book so much, too! cheap cialis pills (tadalafil) is a prescription drug intended for efficient treatment of male impotence.